Today I am guest designing for Hambo Stamps. They make very cute rubber stamps, and sell lots of them as digital stamps too. 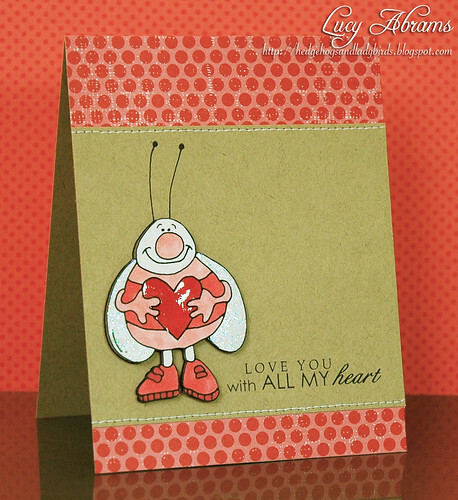 They sent me an adorable Love Bug digi stamp, and I created this simple Valentine card. I used a sentiment from Pink Petticoat's Tiny Sweetheart Sentiments digikit, and yummy patterned paper from Papertrey Ink. I coloured my Love Bug with Copics, then added Glossy Accents and Stickles for some shine... here's a close-up. This is so, so cute:-) Loving his glittery wings! Love your card! And the glossy accents is perfect for the heart! One of my favorite Hambo images! Thanks so much for sharing your talent as a Hambo Guest Designer today! Oh so very cute! Just love the simplicity to allow the complete cuteness to shine through! So glad to have you as the Hambo Guest Designer! What a great project; love the paper and that image is adorable! Love the glossy accents and stickles; just too cute! Thanks for joining us as a guest designer at Hambo!! Welcome, so glad to have you join us! I know you will be an inspiration to me! Way cute! 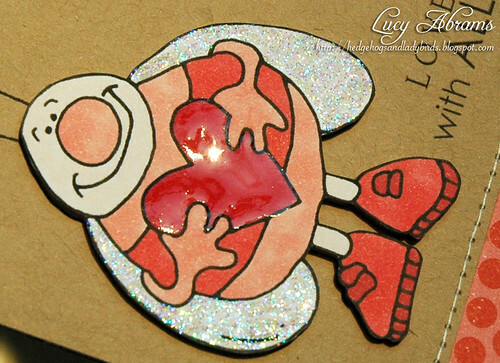 I'm a huge fan of glitter so I love his little wings :) The glossy heart is fab as well...Super adorable! Lucy, this card is fabulous! I love the colors, and the way that that bug just jumps off the page. You are one awesome designer! what a very cute card Lucy. Cute image but I love love love that glossy red heart! Just pops right off the card! Oh my goodness this is just adorable as can be.